Mycobacterium tuberculosis bacteria analyzed under a microscope. April 28, 2014– This weekend, I had the privilege of attending Experimental Biology (EB) 2014, a conference that invites researchers, physiologists, pharmacologists, and undergraduate students to present their latest findings. While I was there, I received the latest copy of the Nature Medicine Journal. In this issue was an article about antibacterial drugs. The article described “redesigned” antibiotics to combat drug-resistant tuberculosis (TB). For many of our antibiotics, bacteria are able to develop a resistance toward the natural products within the drug. The study created novel classes of antibiotics and studied the structural basis of these drugs. The lab also created different forms of spectinomycin, an antibiotic that treats gonorrhea, and found that the various forms showed high activity against multidrug-resistant strains of the TB bacteria. 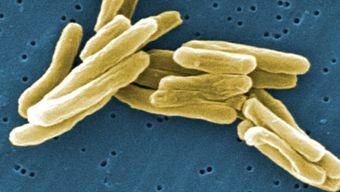 Moreover, lab mice models were used to analyze acute and chronic TB infections– where spectinamide derivatives were injected in the mice. They found that the derivatives therapeutic effects were as strong as current drugs used for TB therapy. Many lectures in the EB conference were about antibiotic resistance, which is one of the most important issues facing scientists today. This article highlighted an important finding and leads to the creation of using these spectinomycin drugs to combat other antibiotic resistance. Lee, R. E. et al. Spectinamides: a new class of semisynthetic antituberculosis agents that overcome native drug efflux. Nature Med. 20, 153-158 (2014). Copyright Writing Science News. All Rights Reserved.